Peoria Roof Masters specializes in residential roof replacement. this involves removing the entire existing roofing system on the structure and installing new weatherproofing components. Our roofers will remove the entire roof and inspect the structural roof deck for any defects during roofing installation. Our trained craftsmen will examine the existing roof structure and determine the best ventilation method for that particular roof. 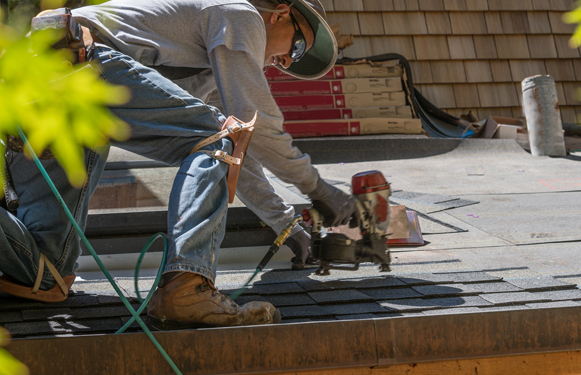 Finally, our team will install the most critical component of your new roofing system: new asphalt shingles. We are committed to installing a complete roof system that will provide our customers with a reliable long lasting roof. We work with top shingle vendors in our are to establish some of the best relationships and warranties for any roofing project. We guarantee all labor for 10 years and have additional product/shingle warranties. When it comes to roofing installation, you want Peoria Roof Masters. Request a quote today. Our goal at Peoria roof and gutter masters is to provide an informed cost-effective solution for any exterior home improvement need, large or small.